It's going to be the best night ever!!! I don't know for Fulton's performance, but Theo Parrish can burn down a dance floor in no time! just near ebisu station on the yamamote line. easy to get to. 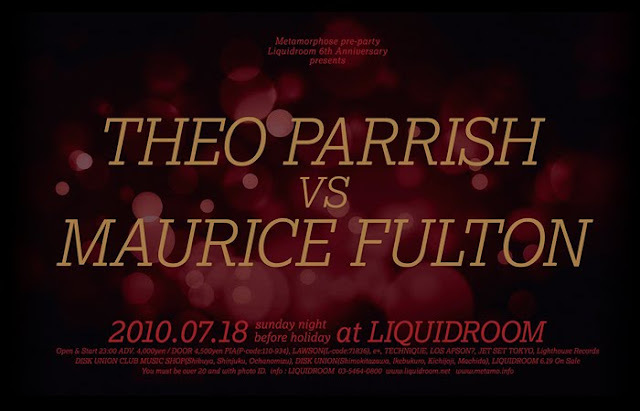 I have been lucky to hear both Theo Parrish and Maurice Fulton play in both small and large crowd situations. Parrish will have no problem confusing the f#!k out of an audience and yet making them dance like they've never danced before. Don't be surprised to hear him start with mambo, veer through James Brown, dub techno, Herbie Hancock, Steve Reich, and end with the goddamn Wu-Tang Clan. Fulton I didn't feel was as approachable and preferred to distance himself from the audience, but he was an impeccable selector and new how to make interesting combinations. Have fun! i've seen both (theo parrish twice) and they both were very, very amazing. living right in the middle of nowhere, it has been quite a long time since i've attended a club night with theo parrish but i still remember that very night when he was twisting and turning the knobs, beating it up with disco boogie tunes like "rare essence - disco fever" (http://www.youtube.com/watch?v=sot4U5Z6ILo&), garnished with a handful of detroit house / techno tracks and jazz-fusion tunes from the likes of hugh masekela & co. he worked out the shape of the groove, producing a sort of education-entertainment atmosphere. maurice fulton instead was concentrated on a more educational aspect of the night with a scintillating and seductive track selection ranging from metallic cold stripped down to the core-tracks, dfa-like tunes, cheesy italo disco and krauty material - not so many of his own tunes, and not those ready-to-kill-the-floor-tracks, but a brilliant showcase of his musical influences and roots. two different approaches to bring you closer to the music, but both honestly blew my mind off. would love to see them perform together. I might crawl out of the Tokyo woodwork for this one. Hope to (maybe) see you guys there.